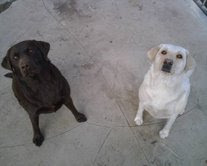 Back in January, the Shelter received an e-mail about two adorable Labs (shown in the photo above), Cookie and Coco, who looking for a home together due to their owner losing her home. It was forwarded to the shelter over 100 times by concerned people hoping we could help the dogs, which we were happy to do. After checking out whether it was a hoax on Snopes.com, we discovered that the dogs had found a new home in Los Angeles where they were from, shortly after their owner sent her desperate plea. If you receive the e-mail with their photo, please refer your friends to their story on Snopes, rather than forwarding it on, since the dogs are not actually looking for a home.